GREGORY: Well, hello, everyone, and welcome. Can everybody hear me? Almost? We’re good now? OK.
I’m David Gregory. I’m so happy to be able to join you tonight. What a great opportunity for me to be part of this conversation with these two wonderful historians. When had the opportunity, I leapt at the chance to talk to Doris and Jay about “Presidential Leadership,” Lessons From History, and that’s what we’re here to do tonight. We will have some discussion among the three of us, and then all of us will be able to join in the discussion to celebrate and lift up Doris’ timely book about presidential leadership, and to reflect on presidential leadership and the broader lessons of history. I do want to point out that this is an on-the-record meeting, for those of you who care about that. And as I said, in about a half an hour we’ll open up to Q&A from all of the members. These are two folks who need very little introduction. Doris Kearns Goodwin is with us, and her latest book is Leadership: In Turbulent Times, which I have a copy of, and I think you can get a copy in the lobby as well. 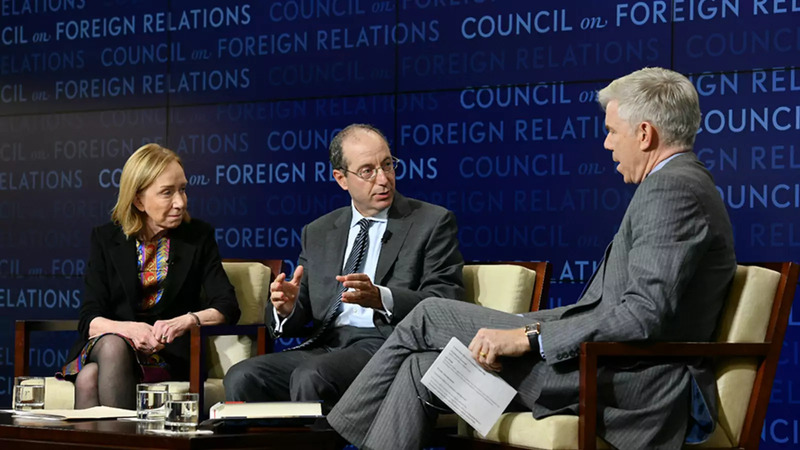 Also, Jay Winik, historian and author, April 1865: The Month That Saved America; and 1944: FDR and the Year That Changed History I think is probably my favorite of yours; and the former historian-in-residence here at the Council on Foreign Relations. So great to see both of you. Thank you both for teaching us and enlightening us and making history so much fun for us to keep learning. I wanted to frame this by asking you both—Doris, I’ll start with you—is presidential leadership a distinct thing? Is it something that we should think of as different from leadership in other domains? GOODWIN: Well, clearly, there are certain things about political leadership that are different. You have to go to the electorate to get—you have to deal with Congress. You have to deal with the Supreme Court and the checks and balances. But I think if you think about leadership as mobilizing people within your team, and then in a larger sense within your organization or within your country to a set of purposes, I think it’s human nature, this leadership. It’s whether you have, you know, the humility to acknowledge errors and learn from your mistakes. That’s relevant in business. It’s relevant as a university leader. Whether you grow in office, I think that’s relevant to all of them. You know, whether or not you have the resilience to get through losses, which we’ll talk about. Whether or not you have self-reflection—(laughs)—whether you can laugh at yourself at times. Whether you have a sense of knowing how to communicate to the people that you need to. It could be a businessperson communicating to his team, communicating to his shareholders, to his employees. Whether or not you can control your emotions. All of those things, I think—whether you can find time to relax and replenish your energy. The things that I think about for political leaders I think are relevant to aspiring leaders, to leaders in any field, because what is leadership but dealing with people? The framework in which you have to deal is different. You don’t have quarterly reports if you’re in the government; you don’t have shareholders in the same way. But I think you still—you still cares—it still matters whether you have the emotional intelligence to know how to deal with a team. And you’re always going to have that in any kind of leadership capacity. GREGORY: And here in presidential leadership, Jay, you had, you know, Lincoln was maybe the earliest at that era, of Civil War, to think about whether this whole idea of popular leadership was even going to work. WINIK: Right. And one of the things that Lincoln really saw early on is just the stakes of presidential leadership, of political leadership, are different from in all other walks of life. What you’re talking about is war and peace. You’re talking about the fate of the people. You’re talking about whether people live or whether they die. And, you know, if you think about Lincoln for a second at the start of the Civil War, consider this for a second. I mean, nobody could have been less prepared to be president or to be the presider over this great Civil War than Lincoln. He was a one-term congressman, a failed senatorial candidate. He had virtually no military experience. He had no executive experience. And he had moods and depressions so great that, as he once put it, he said, I fear even carrying a penknife. And yet, when Fort Sumter was about to happen, when it was being besieged, he had to make a decision: Do we negotiate a peace or do we do something tougher? Do we end up going to war? And this is the unique province of presidents, and Lincoln in a sense kind of was the first one to have to do that. GREGORY: But, in other words, there was a kind of—the stakes are so much higher. GREGORY: And it’s a sense of—presidents, Doris, have a greater sense and really a calling to sort of define the destiny of our country in a way that others don’t. GOODWIN: Yeah, I think something happens sometimes when a person becomes president, and they’re aware of the other presidents before them, and they’re aware that some things that they may do may be remembered over a long period of time. I think they start thinking that way. I mean, I think the best presidents are those for whom ambition for self starts out, perhaps, when they all start running for office, becomes something larger, and ambition for having accomplished something that will stand the test of time. And that’s when you get a good leader that I think becomes a great leader. I mean, when I think about the difference between Lyndon Johnson, for example, as just majority leader of the Senate, and he had developed—gotten there from the beginning. You know, he had—he had sought power, and then he had a heart attack—a massive heart attack when he was majority leader, just having been done six months before. And he asked himself the question: What if I died now? What would I be remembered for? And then he went in a different direction. He went for civil rights in the Senate and then, obviously, for civil rights when he got to the presidency. And had the war not cut his legacy in two, he’d be remembered as one of the great domestic presidents. And still what he did, when you think about what he did, is extraordinary. But I remember, you know, when I—when I was down at the ranch working with him on his memoirs, he talked about that, that somehow once you get there there’s something different, and then you—the first thing you get done, if it really makes a difference—the Civil Rights Act passes, of ’64—then you think, oh, I can do this! Maybe I’ll do the next one and the next one. We don’t know what that feeling must be like to have made a decision—I mean, and the other side of it is you’ve put people in a war, and people are dying, and they don’t know the purpose for which, and you have to bear that legacy. So I think you’re right. The stakes are really different. WINIK: And I think what presidents see is that they come to realize after a while, after having these massive egos which, of course, is what enables them to run for president, but eventually they realize that they’re part of something much bigger and much grander, much larger, and that they’re just one link in a chain that stretches back to history. If we go back to Lincoln for a second—one of the things that Lincoln thought about—why would he go to this terrible war that would consume so much time and bloodshed and effort—but he thought this was a great experiment started by the Founders and, by God, he wanted to preserve that experiment. GREGORY: And imagine you’re Lincoln and you’re sitting in, you know, the Oval Office at the time he’s president. He’s looking out at the Washington Monument in its construction, which is such a great metaphor for the idea that this thing is still coming together. The country is still coming together and we’re seeing if it all is going to work, and he had to really think about—of all the leaders, of all the presidents, Doris, that you profile here, this was really—these were touch and go moments here. This whole enterprise was either going to sink or swim. GOODWIN: I mean, that’s what we keep forgetting now when we think we’re living in the worst of times that—just imagine what it was like for Abraham Lincoln coming in, as Jay so well knows, when there’s a question of whether the Union will hold together, when six hundred thousand people are going to die, or more than that. He said he wasn’t even sure if he had known what he would have to go through in those first months in office—that he would have had the—he couldn’t have lived through it, he thought the anxiety would be so great. Or even Teddy Roosevelt coming in when the terrors of the Industrial Revolution were much greater than our technological globalization shakeups today—the working class was in real rebellion, the gap between the rich and the poor. There were nationwide strikes. There was violence in the streets, and it was unclear whether or not democracy would survive. So, somehow, he was willing to take that responsibility when it was unclear whether capitalism would survive. You know, and even LBJ coming in when the racial tensions were escalating—there was no sense that there would be a bill that would get through the Congress to desegregate the South and the assassination had taken place and people thought it might be a conspiracy. So we’re living in a complicated time right now but I think that’s what history can tell people is there’s a perspective, there’s a reassurance—that we went through these times but we had the right leader at the time fitted for that challenge. GREGORY: Well, and that’s one of the questions, right. Do the times—does history make the man? Does man make history? Is great leadership—the kind of leadership that would lead historians like both of you to write about these figures hundreds of years later—is it the opportunity that’s borne of crisis? WINIK: I think it is the opportunity that’s borne of crisis. But more than anything else, I would say, in effect, man does make history—that the leaders do make history. It is impossible to think about the Civil War without thinking about Abraham Lincoln. It’s impossible to think about the Civil War or the Emancipation Proclamation or the first inaugural or the second inaugural without thinking about Abraham Lincoln. It’s impossible to think about the birth of this nation, which gave us our first DNA, without thinking about George Washington. We were talking about this earlier, that when Washington was facing this potential uprising among some of his officers because they felt they weren’t being paid enough and they actually thought about instituting a coup. And so they went to Washington and he said, OK, let me address your grievances. He pulled—he pulled a sheet out of his pocket like this and he was about to read it and then all of a sudden he said, excuse me, gentlemen, and he reaches in and he does something they had never seen before. He pulls out a pair of glasses, puts them on, and he says, pardon me—it seems that in the service of my country not only have I gone gray but I’ve gone blind. And on the spot these men, these potential coup plotters, they began to cry, and they were so overtaken by the emotion of the moment. And there you see Washington again talking about preserving the moment of this nation. GREGORY: And the symbol, right? The symbol of sacrifice—of leadership. WINIK: And the symbol. Yes, the symbol. GOODWIN: Yeah. You know, I think the important thing to remember is it’s true that the opportunity makes potentially a great leader because the crisis and the challenge has to be overcome. But it also can produce great failure. I mean, think about Buchanan is there before Lincoln and he was considered, until a few weeks ago, the worst president in the presidential ranking. (Laughter.) No, that’s not me speaking. That’s presidential historians. So what happened is in the last presidential historians’ poll President Trump was put below Buchanan, and the great story in the newspaper was that the Buchanan family was celebrating because they were no longer—(laughter). Or think about—think about Herbert Hoover was there before Franklin Roosevelt when the Depression had already started, and he didn’t have—he had a more fixed temperament. He didn’t have that optimism. He didn’t have that willingness to experiment that FDR had. GREGORY: So can you both address this broader idea of emotional intelligence, and you used that phrase, Doris, in the book. The ability to master narrative for the country—to be a great storyteller—but in the way—and this was interesting because you write about Lincoln this way, but, of course, we think of it in more modern history with LBJ—having a sense of what people need—not the country—what lawmakers need and what the country needs, and why that contributes to great leadership. GOODWIN: You know, I think just the first part of your question—I think it’s true that what the leaders provide is a story for the country. GOODWIN: People need a narrative. I mean, Lincoln was asked sometime, why do you tell so many stories. I mean, he would tell funny stories but he also would tell stories in all of his great speeches—this is where we’ve come from on slavery, here’s where we are now, and here’s where we have to go. He said people remember stories better than they do facts and figures. I think it’s hardwired in our brain. Like in the old days before we even had writing that was printed, they would tell stories from one generation to the other. GREGORY: You know, in the modern context we talk about President Trump, hardly a man of the people, and yet has a common touch in ways that confound people. Reading about FDR you think about the same thing—this patrician background—and yet, he was able to cultivate a sense of what the working man and woman was going through. GOODWIN: And what he imagined in his mind was he would picture, when he was giving one of those fireside chats, a shop girl behind the counter or a mason or a construction worker, and he was talking directly to them. I mean, Saul Bellow talks about walking down the street on a hot Chicago night when one of the fireside chats was on the air, and you could look in the windows and people are sitting there in their kitchens or their living rooms just looking at the radio and you could hear his voice coming out in the street and you could keep walking and not miss a word of what he was saying. (Laughter.) And then this, like, story of a construction worker coming home one night early and his partner said, where are you going. He said, well, my president’s coming to speak to me in my living room tonight—it’s only right I be there to greet him when he comes. I think the bond that FDR established with the people—you’re absolutely right—through the fireside chats, they felt he was their friend. Indeed, when he died, the New York Times reported that all over the country strangers are hugging each other and saying, my friend is gone. And then one person wrote, you know, it’s amazing that one person dies and a hundred thirty million people feel lonely. That was the key to his leadership—that he understood that he had to create a bond to take them through the Depression and then through World War II with the citizens, but he used it to educate them. I mean, those fireside chats are pretty meaty. I mean, they’re not—you know, they really talk to you about the banking crisis. Just the first one, if I may describe it, because I’d forgotten it was the first fireside chat until I put it in this—in this book because I’d started—(inaudible)—time later. But the banking crisis was on. People were taking their deposits out of the banks. There were long lines. Banks had closed. So he calls a bank holiday that—euphemistically named a bank holiday. All the banks are closed and he’s got a week until they’re going to open again to figure out a banking bill that will shore up the weaker banks and then keep the stronger ones going. So he describes to everybody why the banks didn’t have enough money. So he tells them, the reason they don’t have the money to give you is because when you give your money it doesn’t go into a vault. It goes to mortgages and to keep the economy going, and some of these banks had invested in the stock market and their money’s gone. Others did not, but their assets weren’t strong enough right now to give (the cash ?). So they were going to get the currency there. And then he ends up saying, it’s safer for you to bring your money back to the bank—I promise you—than to keep it under your mattress. So the banks opened the next Monday morning. Everybody’s terrified—will they come and take their money out again if it’s—long lines again. They’re bringing satchels to bring it back to the banks. I mean, it’s amazing that you would trust a leader that way. WINIK: And then the other thing about these leaders is we sometimes forget just how difficult the trials are that they’re going through, and when we look back at history, some of these things seem inevitable. They seem like they neatly fall into place. If we take a look at Lincoln for a second—as late as 1864, and this was almost a year after the Gettysburg victory, there was the Battle of the Wilderness. And in this Battle of the Wilderness in the first Battle of Cold Harbor, within ten minutes they would lose—the Union would lose some ten thousand men. Over a six-week span, the United States—the Union would lose some fifty-six thousand people. That would be as many as we would lose in the entirety of the Vietnam War, and during—while this was happening, Lincoln was pacing the halls of the White House. His hands were behind his back. His head was furrowed like this. His eyes were all baggy, and he kept repeating to himself almost like a mantra, I must have some relief from this anxiety or it will kill me. Well, it almost did kill him. But, nonetheless, when the country began crying for his head and he started saying Grant was a butcher—and that was coming from Lincoln’s wife—and the Copperhead movement was calling for peace and when in 1864 General McClellan, the former general and chief to Abraham Lincoln, ran against him on a peace plank—when all this was happening and then somebody said, you have to get rid of Grant—he’s a butcher—and Lincoln said, I can’t spare that man—he fights. And what we see about these leaders is they can peer over the horizon and they can see things that we don’t see. GREGORY: Well, that’s—that gets to something we were talking about before. Are these leaders—and Doris, you’re writing about Lincoln and Roosevelt—FDR and Teddy Roosevelt and LBJ—are they visionary leaders? I use the example of Steve Jobs in the context of business and technology—that he was able to see things that we wanted and needed that we couldn’t see. Do you think these are men who had that? GOODWIN: Well, I think—you know, Lincoln was later asked at one point, did you ever think that we might lose the war, and he said, I didn’t think that. He envisioned somehow that—I don’t think he knew how it was going to happen. But I think about LBJ. The first night he comes into the presidency he’s lying on this big bed of his in the vice president’s residence with three aides and they’re watching the assassination coverage afterwards. And he says that night—he says, I know what I’m going to do when I get—when I get out, starting tomorrow. First, I’m going to get a tax cut passed. I’m going to get Kennedy’s tax cut that’s cut—that’s been going through the Congress, and then we’ll get the economy expanding. And then I’m going to get the civil rights bill through to desegregate the South. Then I’m going to get voting rights because everybody should have the right to vote—and these people recorded it at the time or this sounds apocryphal—and then I’m going to get education because every kid should have the education they want. And then, finally, I’m getting old Harry Truman’s Medicare through. And, by God, in the first 18 months he figured out the timing of each one of those. The Selma demonstrations affected the voting rights timing. But he had a vision of what the country might be like with a social foundation under it that expanded what the New Deal was. So I don’t know that they all have that. I mean, I’d just like to go back to what you were talking about, Jay. I think we do forget the anxiety of these people and how they sleep at night. I mean, Lincoln—the way he could sleep in the midst of that terrible worry about the war was he would be reading a funny Shakespeare comedy and he’d go to his aides, Nicolay and Hay, and read it aloud so that he could laugh when he went to sleep, thinking about something funny rather than thinking about the anxiety of the war. When Teddy was worried about winning an election and whether he might lose or not, he would write dozens of letters to his friends and family, saying, don’t worry—if I lose it’s fine—I’ve had the best run of anybody and it’d be selfish to want another thing, so he wouldn’t have to feel pity from the people if he lost. FDR, when he couldn’t sleep at night, finally, he had this amazing ritual where he would imagine himself a young boy once more at Hyde Park and his sled would go down the hill and then he’d pick up the sled and bring it to the top. Here’s this paralyzed man imagining sleds like sheep, and then he said finally he could go to sleep. LBJ couldn’t sleep. He’d wake up—that was his problem—wake up in the middle of the night, go to the situation room, and just worry about whether he’d made the right decision. He said he envied Truman, who, once he made a decision, he decided, I made it on the best information I had and in the time period I had to have it and I don’t second guess it. He was constantly second guessing. GREGORY: I mean, we talk about these men of destiny and purpose and unity. But what about just raw ambition and insecurity and do—you know, I think of LBJ and he was trying to, you know, finally measure up, you know, to these Brahmans, you know, who had been in the Ivy Leagues and he carried that insecurity—you know, Teddy Roosevelt, to overcoming physical frailty and at a different kind of point, right, with the dawn of the American century. So, I mean, we talk about the lofty ideals. What about just kind of the base insecurities and ambitions and ego involved and who they were and what they did? WINIK: You have to have all those things. But I really do believe the presidency is a transformative experience. Maybe not the first day. Maybe not the first week. Maybe not even the first year. But at some point, most major presidents get hit by some event that is of such cataclysmic proportions that they realize that they have to become stewards of this nation. They become stewards of something called the American Dream, and you see that whether you’re looking at presidents a hundred and fifty years ago or to this day. And, you know, I’ve written—I wrote in the Wall Street Journal that Donald Trump—and I don’t know how right this turned out to be—but I wrote in the Wall Street Journal that Trump, when he gets into office, he will feel that there is something much larger and grander than him, and as a result of that it will be humbling but it will kind of stitch him into the fabric of this longer thing called the United States. GOODWIN: I mean, I do think the question of where ambition comes from is still a mystery. I mean, think about it yourselves and if you could ask yourself where did your ambition to become what you became start. And sometimes I think it does come from insecurity and the desire to somehow get back at something. When I—when I did an exit interview with President Obama, I asked him about his ambition, because Lincoln, amazingly, at the age of twenty-three, says, every man has this peculiar ambition—mine is to be esteemed of by my fellow man, and so I’m worthy of the esteem. So I said, did you think that way about your ambition. He said no, maybe mine was just to prove something to my absent father or maybe it was because of my race that I wanted to prove something. And I think for LBJ it was that desire to prove something. Sometimes I think it’s as simple as you are so confident. You’ve loved being the center of attention your whole life you want to replicate that. You know, they said about Teddy that he wanted to be the baby at the baptism and the bride at the wedding and the corpse at the funeral. (Laughter.) He had been the center of his family’s life. So had FDR been the center of his family’s life. So you want—you're so used to that sense of being at the center that where better to be at the center? WINIK: And in FDR’s case, of course, he thought, why not be president a third term—why not be president a fourth term. GOODWIN: Well, he thought they did and they probably did. GOODWIN: Yeah. I mean, if there hadn't been the war that had already begun in Europe, there’s no way he could have won a third term or, I think, even run. GOODWIN: And if he hadn't been in the middle—remember, when he decides for the fourth term, I mean, he was ill. It’s a real question in history, as you know so well. But D-Day hadn't happened yet when he had to decide. WINIK: And he wanted—and he wanted the United Nations. Yeah. GOODWIN: Right. So, I mean—so I don’t—I mean, I think it was that he loved being there and didn’t want to leave it, which was true for Teddy, too. GOODWIN: I mean, he comes back in 1912 because he can’t bear not being there, he loved it so much. But you’d rather them love it. You know, my husband once was clerking for Justice Frankfurter, and Frankfurter was not so happy about young John Kennedy because of the father, old Joe Kennedy. So Frankfurter said to my husband, you tell that man of yours—because he was going to leave to go and work for JFK, my husband was—that the only presidents who are any good at all are those who love the job and they take joy in the job. So JFK said to my husband, you tell Justice Frankfurter I’m going to love the hell out of this job. (Laughter.) But there’s something to that. There’s something to that. With all the tensions you have to be able to get fulfillment from it and feel joy in the exercise of people and being with people during the day or else, I think, it’s going to be impossible. GREGORY: Before we want to hear from our members here in a moment, but we’ve talked about the qualities of leadership and, Doris, you write about perseverance, overcoming adversity. Start there, and then both of you identify the other essential qualities that makes a leader. GOODWIN: Well, just think about Lincoln. I mean, that first time he ran he said in that same statement to people, you know, I don’t know whether you’ll vote for me, essentially; I’ve no popular relations to recommend me. And he had obviously had to scour the countryside for books to get any education he had—only eleven months or twelve months of full schooling. But he said, so if I don’t win this election, I won’t be too much disappointed because I’m so familiar with disappointment. I mean, his life up till that point had been so hard. But then he says—which is great—but I’ll tell you something: if I don’t win, I’m going to try five or six times—(laughter)—until it gets really humiliating, and then I promise I won’t try again. (Laughter.) So he overcame—and then he, as you said so well before, I mean, he has a single term in Congress, he loses two Senate seats, and then he finally becomes the dark horse candidate for the presidency. I think what changed Teddy Roosevelt, besides—as you were pointing out, David—that as a young boy he had asthma so he had to make his body, and so he learned to come from a timid, almost invalid child to become that strenuous person he became. But then, also, when he loses his wife and his mother on the same day in the same house—his wife gave birth to a child and then died in childbirth; the mother had come at forty-nine years old to help take care of the mother and the child, and she died of typhoid fever. But then in his depression he moves to the Badlands, he leaves the state legislature, and becomes a man of the West. He said he never would have won the presidency had he not moved from that elite person he was to the man of the West. And of course we know about FDR. He emerged much more strong, much more warm-hearted, much more able to deal with other people for whom fate had dealt an unkind hand because of polio. So if you—I mean, Ernest Hemingway said everyone is broken by life, but afterwards some people are stronger in the broken places. And all of these guys were. WINIK: Yeah, and there really was something to them that I think is indefinable, so we can talk about perseverance, we can talk about tenacity, we can talk about intelligence—emotional as well as practical. But in a sense, why is it, for example, that some presidents can win losable wars whereas others would lose winnable wars? Why is it that they can take people to do things that they never thought they could do? Why is it that they can take an international setting and just change it around? I mean, if we bring it closer to date, say, in Ronald Reagan’s case, with the foreign policy establishment and all said, our relations with the Soviet Union should be characterized by what was called peaceful coexistence, or détente. And it was a forty-year conflict that most people thought would probably go on and on and on, and Reagan comes in, and everybody thinks he is a nuclear cowboy. And instead, he says, if we push the Soviets, they will fall. And in the end they fell without a shot. But to get back to this idea about ambition, it’s so interesting. I’m thinking about Lincoln for a second. And Carl Sandberg once said, you know, there are thirty-three rooms in the White House, and Abraham Lincoln doesn’t feel comfortable in any of them. So he had the ambition on one hand, but he had humility on the other. And I’m not sure humility is something we see in many presidents, but certainly in one of our finest. GREGORY: —and the responsibility of setting the nation on a course. GOODWIN: Yeah, I mean somebody was talking about the pressures that FDR must have faced during the depression and the war, and he said, well, if you spend two years—after the polio—trying to move your big toe, and you took great triumph out of that, you can get through all of this. So that’s—again, if you have gone through some personal problem, and you’ve overcome it, and you’ve come out stronger, somehow you bring that knowledge with you to this much huger domain that you’re going to—about to embark on. WINIK: And in somebody like FDR’s case, of course, we know that during the phony war of World War II, when things were so stressful, at one point FDR actually had a small heart attack. It was hushed up in the press but, I mean, his life was already in peril. And then we know that when he went to the summit in Tehran, where he met with Stalin for the first time, at one point he was sitting around the table and all of a sudden gobs of sweat were coming down his head, and he was unable to speak, and he was almost paralyzed. His eyes became glassy, and he basically almost fainted. And they brought him to a back room, and they told everyone it was indigestion, but what we now know, it was the beginnings of congestive heart failure. And then when he got back to the United States, his health was so bad he would sit at his desk, his eyes were glazed over. He even fell out of his chair several times. And he got a full workup at Bethesda Naval, and they all told him—they said, if you don’t do something, you will die within a year. And those words were prophetic. But it never stopped him. And it’s not only do they become humbled by the office, but in a sense they become—they feel that they will give their life to the office as well. At least we see that in the great presidents. GREGORY: Let’s widen the conversation to our members. Before I take questions, I want to point out that this wonderful series on presidential leadership is made possible by David Rubenstein, so we want to thank him for that. And now to questions—shall I call on them? Q: This is great. Thank you. I’m David Ensor. My question is this: how important is empathy to a successful president? And what’s the relationship between sanity and quality of presidential leadership? (Laughter.) You can imagine what I’m asking. GOODWIN: I’ll start with the empathy. I’ll leave the sanity to Jay—(laughter). No, teasing. I think empathy could be one of the most important qualities that a leader has. I mean, it’s interesting. When you think about Teddy Roosevelt, he acknowledged later that when he first went into politics, he was simply going in for an adventure; not because he thought he could make other people’s lives different. But then politics took him to places that a person of his privileged background would not normally go. He went into cigar tenements. He went in—as police commissioner, disguised himself at night, and he would walk around the slums. And as a soldier, he saw his fellow soldiers, and those experiences broadened his fellow feeling, as he said. He called it fellow feeling. At first you may not feel—you may feel a little self-conscious about trying to go into these other ways of life, but after a while, it becomes conscious, and—becomes unconscious, rather. In fact, he argued that what—the rock of democracy would founder, and it has something to do with today, I think in some ways, if people in different regions, and parties, and religions, and races begin to feel about each other as if they’re the other rather than as common citizens in a country. I mean, that’s divide we’re facing right now. And he understood that. And on a smaller basis, you have to see what other people are feeling and thinking in order to bring them around to a common purpose. So I think—as I say, I think FDR’s empathy grew exponentially because of his polio, because of bringing those fellow patients to Warm Springs where he became Doc Roosevelt. He taught them how to have joy in life again. They’d play water polo and tag in the pool. They’d have wheelchair dances, they’d have cocktail parties at night. They’d have amateur theatrics. And they said he made them feel, even though they were disabled, that they could live a life again. So he understood that. So I would say that, as a leader, that ability to imagine what other people are feeling and thinking, and bring them together with you, is perhaps one of the most important traits. WINIK: Yeah, I mean, I couldn’t—one can’t put it better than Doris just put it. The one thing I would add about empathy is empathy is terribly important because it’s a way of a leader connecting with the American people. And sometimes policies work, but sometimes they don’t work, and when policies don’t work, if you connect with the people, if you give them a sense of hope, if you give them a sense of strength, it still works. I love this one instant I’m thinking of from the end of the Civil War with Abraham Lincoln. The setting—the scene is 1865. It’s April 4, and the war is about to come to a close. And at that point Lincoln decides he wants to see the fallen rebel capital of Richmond with his own eyes, and he steps off of a small little boat onto Richmond soil, and then all of a sudden he hears all these shouts. And he is surrounded by a sea of voices, a sea of faces. And these are former slaves who had just been freed. And they’re saying, glory, glory, glory to God, glory to God. And then one of these former slaves throws himself at Lincoln’s feet and he hugs his foot. And Lincoln waves a stern finger at him, and he says, from now on you don’t kneel to me; you kneel only to God. You kneel only to your creator. Now that’s empathy. GREGORY: I want us to keep in mind that question of sanity related to—(laughter)—temperament, as well, I think, that we can address. I want to keep moving. In the back. Yes, you, sir. Q: Hi. I’m Michael Hirsh. So in the current occupant of the White House one sees absolutely no evidence of some of the attributes you have been talking about, particularly humility; certainly, on the contrary, you’ve seen only a greater sense of certainty that he is the best ever. He has said a number of times that these are two years unlike any other in the history of the country. And so I would just ask—and certainly no capacity whatsoever for reflection of any kind. And I suppose the sanity question comes into play. But I would just ask you, as historians of the presidency, is there any precedent for what we’re seeing today at all? Jay, do you want to begin? GREGORY: Sanity, temperament, and—right, does President Trump have these—because the one thing that’s true—to add on to what Michael is saying—is that you don’t, at this point yet, see in President Trump someone who is looking towards his predecessors as mentors in a way we might have seen with some of his predecessors. Now that may change, but we don’t see that yet. WINIK: Well, the one thing I can say is his time will come. That’s what I believe. I believe the weight of events, the rush of events, the suddenness of things that happen often on the international stage means at some point I think he will find that he wants to know about what previous presidents have done. He will find sustenance in what they’ve done, and I think he’ll find lessons in how to conduct himself. I can’t imagine it being otherwise. GREGORY: But does he have any of the qualities that are being discussed here in these other men? GOODWIN: Well, I mean, the one thing he was able to do during the campaign was to make a large group of people in the country feel he was on their side. I mean, that’s something that Roosevelt did during his presidency. I mean, that—it may be a factional group of people, and that you would hope that when you get into the presidency after that moment of triumph that you expand your base rather than just continue to talk to the base. I mean, that—if I were to give him advice, I mean, Teddy Roosevelt went around the country on a whistle-stop train tour so that he could go to all the states, even once he lost as well as once he won, so that he could make people feel a common sense of identity. I think getting out of Washington, doing that, not just going where you are—I mean, the question of humility is really important because it’s not humbleness. It means being able to acknowledge your limitations and acknowledge your mistakes and learn from them. That’s how you grow in office. GREGORY: —you know, this was coined by FDR. GOODWIN: That’s right, and he understood that. He understood—I mean, when you were talking before about political diagnosis, he diagnosed a group of people in the country who were feeling that they hadn’t been listened to, they were feeling there were elites, a lot of rural people feeling the people in the cities were different than them. And they were feeling anxieties. They were worried about immigration. And he spoke to them and was able to win enough votes in the Electoral College to win. So that has to be understood. WINIK: And as he put it, he says, I am your voice. And I think in a sense, at least for that segment of the population that he really represents, if you think about it, he really comes alive when he speaks to them. You know, one of the things I will say is that this is very early. We’re just—we’re not even two years into the presidency, so it’s hard to diagnose and assess just what the Trump administration is and what it will come to be seen in history. You know, if you look at the—we were talking about Andrew Jackson briefly the other day when we had our call. If you look at the Jackson administration, it’s funny that the great statesmen of the day, like John Quincy Adams and Henry Clay, I mean, their heads almost exploded at the thought of Andrew Jackson becoming president. And they said at the time—they said, democracy as we know is going to come to an end. But as it turned out, Andrew Jackson turned out to be a pretty good president—a little irascible, a little contentious, but nonetheless, a good president. And he did—among other things, he founded the Democratic Party. GREGORY: So we need more time. GREGORY: We need more time. Yeah, where else? Yeah, right here. Q: I’m Jerry Ebbingston (ph). My question is for Doris. Why didn’t you include Harry Truman among your presidents? I mean, after all, there’s the Korean War, you know, which is similar to other wars. And he was president of change—certainly the president of change—and he was the president of humility, you know. It seems to me he was ideal for inclusion in this book. GREGORY: Doris can only spend time with so many of these presidents. GOODWIN: (Laughs.) No, I mean, I think what happened is when I was deciding what to do next after I finished The Bully Pulpit with Teddy and Taft, I had a choice. I could find a new president to work with, and maybe it could have been someone like Harry Truman. I think the world of Harry Truman. Or—but I could just decide to keep my guys. I just didn’t want to let them go somehow. (Laughter.) So, I mean, each time I left one of them as I went from—you know, from Lincoln to FDR, and then FDR to Teddy and Taft, I’d have to move their books out of the room, and I felt like I was leaving an old boyfriend behind. (Laughter.) So I decided I’ll just take the guys I know the best who I’ve spent so much time with—I mean, I’ve spent ten years with Abraham Lincoln and then another five years on the movie on Abraham Lincoln. I’ve spent seven years with Teddy Roosevelt. And I’ve spent longer than it took World War II to be fought with FDR—(laughter). And of course, I knew LBJ. So these were the people I knew the best, and I decided I just wanted to look at them through this lens of leadership, asking the questions that I hadn’t fully asked myself: where does ambition come from, does the man make the times or the times the man, and are leadership qualities inborn or not. I knew them. You know, I mean, I spent so much time with them that I felt like it was a weird profession to spend one’s days and nights with dead presidents and think about them so much. My only fear was that in the afterlife there would be a panel of all the presidents that I ever studied, and everyone would tell me everything I missed about them. And then the first person to scream out would be LBJ: how come those books on the Roosevelts were twice as long as the book—(laughter)—so they were my guys. They were my guys. GREGORY: That would be great. Right up here, second row. Yes, ma’am. Q: Thank you. Toby Gati. If you look at history, other countries had leaders, too. Some have been very destructive leaders, and you might say it’s easier to destroy a legacy than build one. But your definition of leadership seems to be premised on the idea of creating. GOODWIN: Well, I’ll just take the definition. It’s interesting. It’s a very complicated thing what leadership is defined as, but James MacGregor Burns, the great political scientist, wrote a really big book about leadership, and he would argue that destructive leaders—like a Mussolini, or a Hitler, or a Stalin—were power holders. They held power. But he would argue there was an ethical bias to the word leadership. So they wouldn’t qualify as leaders, which is an interesting way of thinking about it. GREGORY: Well, they didn’t earn power, right? They took it. Q: I know other countries better than America—(laughter)—(inaudible)—people who are destructive leaders, and I think they are leaders. And I wonder if you don’t have a bias that leadership has to be a positive quality. GOODWIN: That may be—that may be true. That may be true. I’m not sure if I agree with MacGregor Burns, but I think that’s an interesting thing that he thought about. Q: I mean, Trump would never fit into that definition of leadership no matter what he did. He doesn’t want to do the things you have described. (He doesn’t want a new voting act ?). Q: So how do you fit Trump in the definition? GREGORY: But I think there is also a bias in that question. I mean, there is another view, right, which is about Trump that may want to position America differently in a way that a lot of people would agree with, you know, in terms where America fits in the rest of the world. WINIK: Yeah. I want to get back to your question, but historically a little bit. In my book, 1944, which was about FDR, and D-Day, and also the Holocaust, I spent a lot of time writing about the Nazis. I spent a lot of time writing about Hitler. And to my surprise—I don’t want to say, to my surprise—I felt it was very important to delve into Hitler’s psychology, and his world, and his—and the things that he brought on the world because he was just such a significant figure—not in a good way; in a terribly bad way. But he was certainly a profound figure, and he was the reason why all this was happening in World War II. And to understand the nightmare of aggression, imperialism, genocide, you had to understand Hitler. Similarly, when I wrote my book, The Great Upheaval, about the 1790s, I found myself being captivated by Danton and Robespierre, of course, who masterminded the guillotine. And certainly they were—in many ways they were negative leaders, they were anti-leaders, they were anti-heroes, but I tried to write it up in such a way that if they were to read it, they would say, he did justice to me. But inevitably I will say, a little bit of my bias would creep in because these are not people who I would ever want to see in this country. Q: Thank you. Paula Stern. Actually building on where we’ve been going, including Toby’s question, is the notion of empathy and the sense of the example of Franklin Roosevelt was my friend, and we all lost a friend, and this ability to have this empathy. It seems to me that Donald Trump also channels this—notions that are empathetic with those who are feeling left out, resentful, and very much a forgotten person if you will. So it’s not the empathy. And so I’m just wondering if you can kind of move from that characteristic, which seems to be important for a leader, into this more normative and value-laden question of, well, do you empathize with resentment of the little man, or can you empathize with the little man in some sort of a positive way. GREGORY: It’s almost—it’s related to someone we were talking about before who was kind of, you know, stoking resentment and division for—as a—as a means of leadership, right, to create—to create factions and to build on those factions, rather than—and I think maybe Toby’s getting at this as well—which is this idea of, you know, if you’re not necessarily pursuing national unity, you could be trying to lead in another direction that secures power. GOODWIN: I think that this is great that you guys are building on each other. I think it’s great. GREGORY: Yeah, in the corner. Yes, sir. Right there. I would like your historical perspective not on the persons, but on the times. And I would like you to compare the kind of challenges we’re facing today with some of the previous ones we’ve discussed—not only the political division, the economic inequality, but things like the specter of climate change, even artificial intelligence. On our scale of crises calling for effective leadership, where do we stand today? WINIK: Well, what I would say about that is that whatever it may feel like today—and we’re buffeted about by the media, we’re buffeted about by cable networks, by the social networks—we have been in much worse times. We are not involved in a great Civil War. We are not involved in World War II. We are not involved in building a new country out of scratch. In each of those cases, those presidents and those leaders and the people of the day, they faced really kind of great and profound challenges. In the first case, it might have meant America might never have gotten off the ground. In the case of the Civil War, we could have devolved into two countries. In the case of—in the case of World War II, were we not vigilant, did we not have the wise stewardship of FDR, we might have ended up with Europe being under the thumb—the permanent thumb of Nazism. And then, of course, there was the Depression, which you write about in your most recent book. So all of those things are, I think, much more profound than what we face today. Today the issues are real. They’re serious, but I think they feel worse in some ways than they are. But it’s hard to tell. We need history to give us, I think, some perspective. GREGORY: Well, but that raises an interesting point. GOODWIN: —unless actions are taken by people. I mean, FDR used to say problems created by man can be solved by man. So if we assume that we’ve created some of these problems, there are somewhat answers, at least the U.N. report says, to slowing it down if we do it. If we do it. GREGORY: Can I follow on that, Doris? Because it goes—to me, that issue goes to the issue of urgency versus importance, right? That government doesn’t do well with issues that are important, they deal well with urgency. GREGORY: And, you know, we didn’t get into World War II when it was important; we got into it when it was urgent. GOODWIN: Right. Very well said. GREGORY: And that seems to be a problem with this issue of climate change. Q: Hi. I’m Mary Sarotte. I’m a historian and a former White House fellow. Q: Yes. And drawing on your expertise on presidential leadership, I’m wondering if you’d be willing to assess the leadership style of either the last Soviet president, Mikhail Gorbachev, or the current Russian president, Vladimir Putin. Thank you. WINIK: Well, I’m not going to say dosvidaniya. I’ll take a little crack at this. GOODWIN: I can say that. (Laughter.) Zdravstvuj. OK, go ahead. I think Gorbachev is a fascinating figure in history. And we tend to—we talk about Ronald Reagan winning the Cold War. To the extent that Reagan did that, he certainly did it because he had a willing and thoughtful partner in Mikhail Gorbachev. And Gorbachev, I mean, he’s not deft at handling media. He doesn’t keep himself in the spotlight. I mean, all the things that are part of the celebrity age that we live in he’s not very good at. And he in many ways lost the support of his own people. But he’s a tragic, almost—I mean, there must be somewhere in American literature that would define him. But I think in the end he will come out as a very significant leader. And I’ll give you an analogy. And I don’t want this—I don’t want this to be mistaken, what I’m saying. Abraham Lincoln obviously did what he did in the Civil War, and U.S. Grant did, in bringing the war to an end. But at the end of the war, we could have devolved into guerilla warfare and had a really divided, Balkanized country for many years to come. But thanks to Robert E. Lee, we have a willing partner—somebody who, rather than calling for guerilla warfare once he resigned and once he surrendered, he tried his best he could to be a good citizen of the United States even though he never became a citizen of the United States. I see Gorbachev as being in the mold of somebody like a Robert E. Lee—tragic, a little understated, doesn’t get the credit he deserves, but deeply, deeply historic. Now, the other person you asked about was Putin. I don’t know enough about Putin, but Putin is a strong leader. One person I do know a lot about is Catherine the Great. And he is Catherine the Great without the charm and without—and without the culture. (Laughter.) But she was a—she was a great imperialist, and I think what he’s trying to do is he’s trying to enhance and enrich and strengthen the Russian empire. GREGORY: I wonder a little bit, are we living in an age, you know, at the biggest level that feels a little bit more like the 19th century—you know, kind of great game atmosphere where—you know, I think about this Saudi Arabia story, this awful murder of Jamal Khashoggi, and whether, rather than assert U.S. values, we’re looking at this as an instance of whether maybe we have leverage over the Saudis to use against Iran or in our—in our other priorities. And that would be a departure not to a—we’ve always been pragmatists in various administrations, but to step away from asserting U.S. values. WINIK: Yeah. Well, I think that’s a tragedy to step away from U.S. values because it’s U.S. values which from the very beginning of this country has separated us from the rest of the world. What made us so different from the rest of the world? The rest of the world was busy trying to resolve conflicts, and they did it through bloodshed and they did it through violence. We’ve always done it through peaceable discussion, and through a respect and a—and a caring for human rights and human dignity, and for bringing democracy to all the American people. And it’s a dream that we’ve had in our country, and I think it’s a dream that’s worthy of the rest of the world. GREGORY: We’ll take two more questions. Sir. Q: Thank you, Sam (sp). Fred Roggero, retired Air Force. One question as you look past to your guys in history. And this has been fascinating; thank you very much. At some point the American people chose somebody else right after them. They either liked or didn’t like the qualities that you’ve been talking about in leadership today. So, putting that in the context of two years from now, not to ask you to forecast who the American people are going to choose, but what qualities do you think that person will have after this presidency? Thank you. GOODWIN: I think you’re right that there are certain cycles that you’ve been through. Arthur Schlesinger used to write that there were—there were thirty-year cycles, actually, where you’d have a movement of the citizens—whether it was the antislavery movement, then the progressive movement, then the New Deal, and then the civil rights movement—where the citizens wanted to have an active government and they wanted to be dealing with the problems of the time, and then other times when, post-World War I, they just want to go back to private lives; they want to not think about public issues. Or the same thing in the 1950s, you could argue. And then the leader might be chosen to reflect those larger changes that happen in society. But I think there is—there is sometimes a reaction against the person who was there before, and that’s what the midterms may assume. But even in the presidency I think that can happen. And it’s something that’s not even conscious, I suppose, on people’s parts in a certain way. They’ve just reacted against, you know, an imperial president in Nixon, and then they get a Jimmy Carter, you know, who wears a sweater and just says I’m Jimmy Carter. Because they—and then they feel like Jimmy Carter has been too much of a non-imperial president and they want a Ronald Reagan, who will restore the dignity of the presidency again. So, you know—so if there is something that will come out of this divisive time, which was partly there before President Trump and is still there now, if it continues divisively, I think we’re going to look for somebody who can somehow heal those divisions. And I keep thinking, I mean, it’s interesting you were in the military because I think why the military is in such respect right now, it’s the one institution—I mean, Congress is at like eleven percent; the military is up in the seventy, eighty percent—is because they understand the importance of a common mission that crosses all the lines and they’re working together for something. My own hope for this country sometimes is that there will be a national service program. Teddy Roosevelt wanted it. Eleanor Roosevelt wanted it. There are several generals who are arguing for it right now: when kids come out of high school, they can spend a year or two working on some common mission in another part of the country, maybe living in a host family in another part of the country, so they can see each other as other people working together in a common way. We need to restore that sense of not just civility, but of understanding of different people and feeling like we’re Americans again without a crisis, without a military crisis to do it. We’ve got to create a situation that will make it possible here. GREGORY: A sense that we’re in it together. Q: Which is why I’m here. GOODWIN: He was the best. Q: He was indeed. Great man. And I’ll give you my smush (ph) piece at—before you leave. GOODWIN: I’d love to have that. Q: But I guess what I wonder, if I could read Richard Goodwin’s prose, “I’ve always wanted to write a play about the pope and Galileo in which the pope emerges as the hero. What difference does it make that we know the Earth moves around the Sun if it destroys our faith?” So I guess the question from this lovely soliloquy of your husband is whether there’s a kind of cynicism now, whether because Donald Trump seems so irrational and hard to cabin in so many circumstances, or whether it’s some kind of deeper cultural self-doubt that pushing hard other than making money is just not worth the price? GOODWIN: Well, I’ve love to have David talk about that because he’s written about faith. And I’ll just say this as far as what my husband was doing. When he died last spring he had been working for several years on a book that talked about what his public service meant from the time he was young and how honorable it was to give one’s life, essentially, to public service. And he really believed in the—just like Jay was talking about, that he really was in love with the ideals of America—I was almost teasing that he would call the book My Love Affair with America—from the time he was young. And he saw what was happening right now and he was so troubled by it. And, in fact, he had written a series of L.A. Times editorials in the 1980s about the gap between the rich and the poor and the squeezing of the middle class, and he felt that something was happening in the country that it wasn’t living up to those ideals of mobility and education. And yet, at the end he said he had lived—he was older than I was. He had lived through the Depression. He had lived through World War II. He had worked for John Kennedy. He had gotten assassinated. He had been with LBJ and then left him over the war at the moment when he was loving the domestic stuff so much, and was considered a traitor for having done that. And then he was with Bobby Kennedy when he died. And yet, he said America is not as fragile as you think. It’s going to survive, so. WINIK: Yeah, I mean, one thing I want to add to that is that—is that on the one hand what we’re talking about tonight is great presidential leaders, and the qualities of that, and what it does, and what it looks like. But one final thought that I think it’s worth leaving you all with is just what America is, and the strength and really the genius of the institutions of America. We have survived just you were talking about a great Civil War. We have survived two world wars. We have survived a Depression. We have survived an attack on New York City on 9/11. We have survived bad presidents. We have thrived and found great presidents when we needed them. There’s something about the genius of this American experiment and the institutions. And not only do we have the best of people when we most have needed them, but we’ve had institutions that have strengthened us and guided us when we’ve really needed them. So that’s worth thinking about. GOODWIN: And it’s—and it’s not just the leaders. I mean, I think what my husband was arguing, what I believe in too, most change for social justice has taken place in this country when citizens band together. I mean, Lincoln was called the liberator. He said, don’t call me the liberator; it’s the antislavery movement that did it all. Clearly, without the progressive movement, the settlement house movement, the social gospel and religions, that Teddy Roosevelt wouldn’t have been able to do what he did. Without the civil rights movement, LBJ would never have been able to do what he did. Without the women’s movement, the environmental movement, the gay rights movement. So right now, whatever we’re feeling about the country, it’s the citizens ourselves that have to band together and figure out who we want as our leaders, what we are going to do about it. And there are things we can do. As I say, man—as FDR said, man creates problems, we can solve problems. But it’s always that connection. Leadership’s a two-way street between the leaders and the citizens, and it’s up to us as citizens to make this—to reform the political system that we’re feeling not just because of President Trump, but it’s been broken for a period of time. There’s things we can do and we have to do. GREGORY: You know, maybe that’s the fitting way to end, is that notion of, you know, what Lincoln understood as the fragility of this—you know, this thing that we call America. It is strong and robust, but still fragile and still always growing. Am I right? It’s all of our responsibility to keep growing it and to keep it moving forward. GOODWIN: Oh, you’re welcome. Thank you.